DC recently (and by recently, I mean months ago, but that's recent enough news for this blog) upped the hours you need to feed the meter for. Until 10 on weeknights, and on Saturdays (previously, most Saturdays were free). I'm not complaining about paying for parking, but it doesn't really make sense. They also increased the rates. For a dime, you get something like 3 minutes. For a quarter, you get something like 14 min. I can see charging this downtown during working hours, but in the evenings and weekends, it's stupid. If they just enforced the limits, that would be fine. I forgot that the hours had been extended and on one of my days off (my UNPAID days off, by the way), I came over for my VOLUNTEER position. I stopped at a meter and pumped in quarters, getting 2 hours (i.e. $4). Then, for some reason, I thought "Is this for handicapped people only?" because there was a sign on the meter about something to do with handicapped people. Let me remind everyone, I'm a DC resident and yet, I did not understand the meter or signs. So, I moved. Not all meters looked like the other one, but I found out later that that one was NOT for handicapped people only. By this point, I had no change left. And, the next meter was broken. It was a stupid stupid night. And it's a stupid change. Instead of making money for the City, I wouldn't be surprised if it's having unintended negative consequences. Case in point, fast forward to today. I leave my house and see the bus zoom past my street. So, I ventured forth from the snow for the first time in my car to go to the gym. I neglected to remember this whole meter thing. I have no change. I tried parking in the lot across from the gym, but the guy was there taking money (previously, it would be unattended on nights and weekends). I parked on the street-but to do this,I put a dime in and went into my gym to get change, came back out, and put the money in the meter. I only had enough for 1 hour (a little over $2). When I was going to the gym, I had originally considered running a few errands nearby. But, instead, I drove home. I would have spent money and supported local businesses who in turn pay sales and property taxes, but instead, because I didn't have any friggin' quarters, I drove home. As an urban economist of sorts, I'd be really interested to know what the impacts of this move have been. By having night and weekend charges at that rate, the government is really punishing the people who are frequenting businesses and paying taxes as residents rather than just capitalizing on people who have to be there (workers...there are impacts with that too, but I'd argue it's not as big of a deal). So, anyway, that is my annoyance today! I love the photo above by volcanojw! Incidentally, this is one of the meters that confused me into thinking it was only for handicapped. Meters. Seemingly innocent things, they become the bane of everyone's existence--the outsourced management companies, the City, the tenants of nearby buildings, the people who use them. 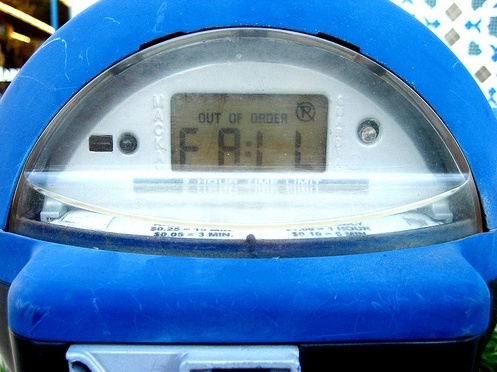 I've encountered similar metering goofiness and have written about it in the past, but it appears that Cities ought to employ a full-fledged cost/benefit analysis when making new decisions on changing meter prices or regulations. All this for a machine that in most cases accepts nothing larger than a quarter! Definitely, Eric. I really think that the decisions cities make on parking need cost/benefit analyses (and not just because my company could potentially do them!!!). Some cities do engage consulting firms to look at parking provision and costing, and others don't. For all I know, the District has. I actually just today saw an exhibit on parking at the National Building Museum. It wasn't the most interesting exhibit I've ever seen there, but what I found interesting was how deciding where and how to put cars is intrinsically linked to economic development and the different approaches to this. I'm fairly certain you can park at DC meters that say fail on them, but you're still restricted by the time limit. You can also call the meter hotline and they'll give you a reference number in case you get a ticket but I've never gotten a ticket while parked at a broken meter. Hey Julie, thanks for the comment. Yeah, I did call the meter hotline. My problem is actually with the stupid changed hours. I had another story, with my mom and I going to dinner at Founding Farmers. Because we were going to the National Geographic afterwards, I couldn't park at a 2-hr meter, nor did I have change. For some reason, I didn't see the lot that was right across the street from the restaurant. I ended up driving around for awhile and lot after lot downtown was closed. Then, I finally found one at 17th and I and it closed fairly early from what I recall. In the end, sometimes the parking can affect the amount of time people spend in a place.